Multiple Cruises To Choose From! Multiple Cruises To Choose From Below! Santa will be on board mingling with guests and spreading holiday cheer! Santa hats and candy canes for all! Enjoy Christmas music on the first deck as well as a full bar! Shake your groove thing to some family friendly party tunes on the second deck dance floor also with a full bar! Enjoy the best views of the Chicago skyline from our top deck. Snap a pic while you're at it! Make sure Santa knows everything that you want this year by writing him a letter at our "Letter to Santa" station. Specialty holiday cocktails will be available for those of age! Get your tickets now before you end up with coal in your stocking! Fundraising Opportunity: Are you trying to raise money for a certain cause? Email Fundraising@ChicagoChristmasCruises.com for more info! Want to celebrate your birthday on the boat? If you have 5 or more people in your party, your ticket is on us, and all your friends get a discount! Email Birthday@ChicagoChristmasCruises.com for more info! Group Rates Available for groups of 5+ - Email GroupRates@ChicagoChristmasCruises.com for more info! All attendees will also receive the following Freebies*: 2 FREE rides from Via using promo code 'CTS2' – Get $10 in DoorDash cash from DoorDash – $10 in FREE food at your favorite restaurants like Freshii, Protein Bar, Rockit & more from Ritual! *All offers valid for first time users only and subject to change without notice. Click HERE for more info! How do I get to the boat? Please see below for a map and a detailed list of directions. What do I need to bring to get into the event? Your printed ticket from Eventbrite that displays the square QR code. If you plan to consume alcoholic beverages, you must have a valid 21+ government issued ID. Does my child need a ticket? Yes. ALL attendees of all ages must have a valid Eventbrite ticket to enter the event. If you have a child under 6 months of age, please email us at Baby@ChicagoChristmasCruises.com for a ticket. Must email in advance. 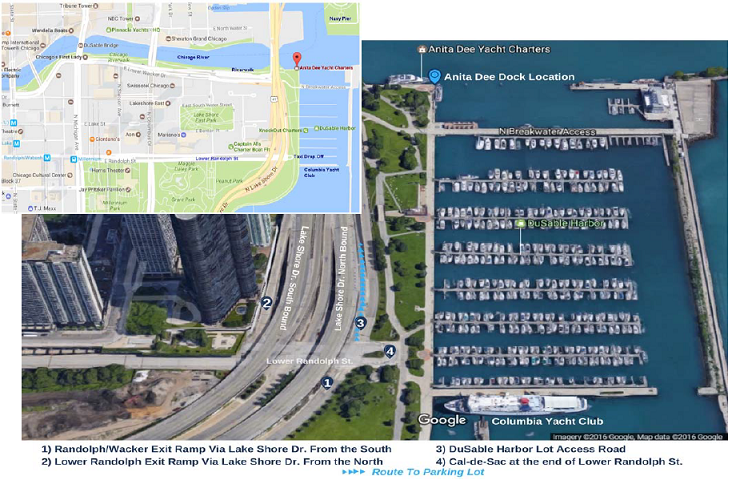 The Anita Dee is docked at DuSable Harbor on the South side of the Chicago River at Lake Shore Drive. ** Since the Harbor has no real physical address, GPS and online directions are unreliable. Use the maps along with the directions below to get to the boat! Immediately after you turn, merge left to ramp leading down to parking lot. At bottom of ramp, take ticket at the gate (pay upon exit) then drive straight to the end of the lot. Park, walk out of opening on the right/east side of the lot. Both yachts will be to your left on the River. Take Randolph St. exit off of Lake Shore Drive. Turn left at bottom of Randolph St. exit ramp. Turn left at second light (Do not enter cul-de-sac). Exit to Randolph/Wacker Dr. off of Lake Shore Drive. Stay in middle lane of ramp. At bottom of ramp, proceed straight beyond traffic light. Merge left to ramp leading down to parking lot. Park, walk out of opening on the right/east side of the lot. Both yachts will be to your left on the River . Alternate Parking Locations: In the event that DuSable Harbor Parking Lot is at capacity, we’ve listed additional parking options. If getting dropped off by taxi, instead of telling the driver an address, tell them to drop off where lower Randolph Street meets the lakefront, DuSable Harbor, or Columbia Yacht Club. Walk down to the lake front path and turn left/walk north along the lakefront. Our yachts will be straight ahead at the end of the lakefront path where it ends at the Chicago River. Taxis can also go inside to the end of the DuSable Harbor Parking Lot which is closer (directions above in ‘Driving’). If they’re there for less than 15 mins, there is no charge. Take any stairway down to the Riverwalk on the south side of the Chicago River. Walk west on Illinois to Lower Lake Shore Drive, the first street on your left. Cross Lower Lake Shore Drive to the west side of the street and turn left. Once you exit tunnel, you’ll see both yachts to your left on the River. Head east on Monroe and cross over to the east side of Lake Shore Drive. Turn left or walk north on the lakefront path. Once you pass Columbia Yacht Club, keep walking north for 4-5 mins- Path ends at Chicago River and our Yachts. A valid ticket with scannable QR code is required by all guests to board. It is recommended to print a paper ticket to prevent any technology complications which would prevent your ticket from displaying on your phone. There is no guest list at the boat, each ticket must be scanned. Security reserves the right to inspect all bags and persons. Guests who are deemed intoxicated (or otherwise unfit) upon arrival, will be denied entry and no refunds will be given. The boat will depart the dock as soon as boarding is completed. Once the boat begins its cast off procedure, for the safety of all guests, absolutely no late arrivals will be allowed within the security fence to board. If you are late, you will be left at the harbor without a refund. In the event of dangerous weather conditions, security situations, mechanical issues with the locks, the boat, etc., the boat may not cruise, but the party will still go on at the dock. In the event of rain, or other inclement weather, the party will continue on the enclosed portion of the boat. Any ticketing/technical issues will be handled by Eventbrite.com. Please contact them directly at https://www.eventbrite.com/contact-us/. Sorry – no refunds or price adjustments. Cruise length will vary based upon multiple factors, including, but not limited to: boarding time, lock operations, boat traffic, weather, special events such as fireworks, emergency situations, etc. The music's volume level will be set to an acceptable level intended to please all guests and may be regulated/limited by safety regulations set forth by the captain.